This week, Your News to Know brings you the latest stories involving gold and the overall economy. Stories include: Famed author Jim Rickards sees gold reaching $10,000, gold breakout coming to an eerily quiet market, and gold flirts with $1,300 amid falling rate hike expectations. Going against established market sentiment, famed author Jim Rickards says he doesn’t see a rate hike happening this month despite expectations. In an interview with Kitco, Rickards said that those expecting a rate hike are ignoring an important issue that the Fed continues to struggle with: disinflation. With the Personal Consumption Expenditures index (PCE index), going from 1.9% to 1.3% in the span of nine months, it doesn’t look like the Fed will meet its inflation target in the near future. The discourse from the latest Federal Reserve meeting supports Rickards’s stance, with officials noting that deflationary pressures continue to subdue the PCE index. Some also warned that a December hike might not be prudent as it could accelerate deflation. The dovish tone from the meeting already helped gold come close to the $1,300 level, reaching $1,295 an ounce amid concerns that the Fed is pulling back. To Rickards, however, this is just the beginning, as the investor sees markets taking a 180-degree turn once participants realize that a December rate hike isn’t going to happen. He believes this will cause the dollar and bonds to sink while further strengthening gold’s rally. Ultimately, Rickards thinks gold’s back-and-forth at the $1,300 level is a minor struggle, as he sees gold reaching $10,000 an ounce in the long term. Instead of just a flashy prediction, Rickards insists this is a realistic level if the Fed wishes to keep deflation at bay. According to one metals expert, the recent quietness in the markets is actually the calm before the storm. And it’s one that could be followed by a rally in precious metals. As seen on CNBC, Michael Dudas of Vertical Research sees gold breaking out as early as this month due to two important events: the Federal Reserve meeting later this month and the battle over the tax reform package. “It’s tough with the events coming up – whether it’s the Fed or tax reform which is very, very important. I think that could lead to volatility,” Dudas told CNBC. The analyst believes that a volatility surge will send prices higher, forecasting that gold will reach $1,400 an ounce by the end of 2018. He says high inflation expectations in the coming year could give enough support for gold prices to surpass that. According to a recent Bloomberg article, gold continues to approach $1,300 an ounce, driven by both a weakening of the dollar and a series of important political events and economic data coming up. After rising for the third time in four days as a dollar gauge traded close to its lowest level since September, bullion is now on track to post its best year since 2010. The metal is up almost 13% this year, and geopolitical uncertainty coupled with shaky discourse from the U.S. central bank promise to provide ongoing support. “A weaker dollar underpinned gold and traders are covering shorts,” said George Gero, a managing director at RBC Wealth Management, adding that asset allocators are looking towards the $1,300 level. In its report, BMI Research said that gold should continue to trend higher with an average of $1,300 in 2018. Inflation continues to slow down, and Fed Chair Janet Yellen cautioned against rising rates too quickly against a low PCE index, making some question whether another rate hike will happen before the end of the year. Aside from internal strife, the central bank also faces the appointment of Jerome Powell, President Trump’s nominee, as the new Chair. The markets are bracing for the impact of the talked-about tax reform after the results of the week-long debate, with the final draft of the tax plan yet to be seen. 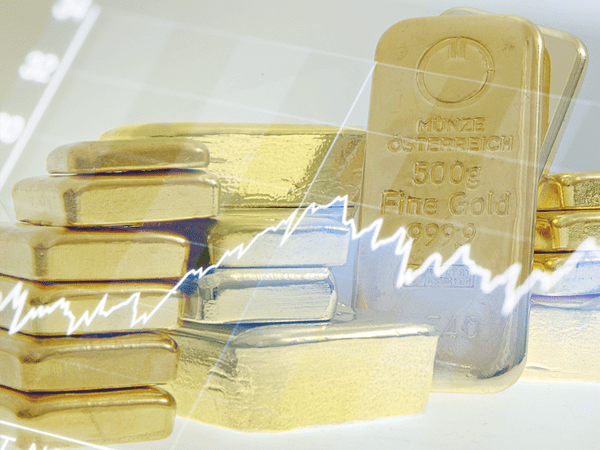 Updates regarding U.S. economic data, which includes gross domestic product, consumer prices and personal spending, could provide additional backing for the yellow metal. “This week has a particular importance for investors due to a number of key events unfolding which includes the OPEC meeting, Bank of England performing a stress test, the Federal Reserve coming in the spotlight and of course the U.S. tax reform,” said Naeem Aslam, chief market analyst at Think Markets U.K. Ltd.